You have to protect your vehicle from scorching summer and freezing winter. You shouldn’t let even a drizzle to steal your beauty. That’s why people use body covers to protect their vehicles from occasional wear and tear. 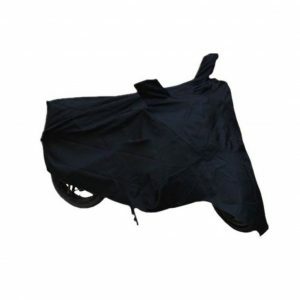 And, I know you are here looking for the best body cover for your Honda Activa. I was in pursuit of a top cover myself. During the search, I have come across a few that would protect the vehicle like a shell. As you read above, I have handpicked the covers mentioned below. You can go through the listing and pick one yourself. Do you have an Activa 4G? If you have, this one will be the best for you. 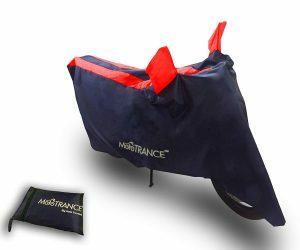 Mototrance is a renowned bike cover manufacturing brand. You can find many of their products on Amazon. 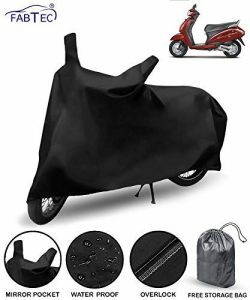 During my quest of finding the top-notch Activa body cover, I have stumbled upon this one. The fabric cover only weighs 299 grams that you don’t even feel burdened by it. After folding, the dimensions will get reduced to 5x 15x 15 cm. The Mototrance cover ensures your scooty look as good as new. The fabric they used doesn’t go hard on the paint. Moreover, it can withstand the threat from rain, dust, and sunlight as well. Maybe, you don’t own an Activa 4G, but an Activa 3G instead. Don’t worry! MotoRoX has got you covered with its Japanese Silver cover. It has a blue lining along the borders for beautification. You know how essential a body cover for overall protection of a vehicle. When the sun shines brights, it will makes a negative impact on the paint. With MotoRoX cover, you can overcome these climatic difficulties to keep your Activa as refreshingly as always. It weighs a bit more than Mototrance (around 349 grams). What if you are uncomfortable with the Red and Blue colour of the Mototrance cover? Well, here comes a single colour offering from Fabtec. Not only does it covers the entire body of the vehicle, but it also provides water resistance. You will get a free storage bag to insert the cover after the use. The heavy buckle locks make sure the cover doesn’t fly away even in heavy winds. The manufacturer has chosen the material so meticulously that it can tolerate even high temperatures. We always look for water and heat resistance when it comes to body covers. However, the quality of stitching is a significant factor one should always consider. You will find this on top in the department. You know the sunlight contains several rays including ultraviolet and infrared. The first one damages the paint and the second one is the reason why sunlight has heat. The cover uses body strap mechanism to hold in place. As for any other product in this listing, you don’t have to shell off a lot of bucks to bag a piece. Honda Activa is a delicate vehicle. You know you have to make deliberate efforts to protect it from occasional wear and tear. Guance has got you the next big body cover with water resistance and the best material quality. You may find it a bit broad as compared to the above mentioned body covers. The manufactures has made it that way to make it fit for every Activa models. It comes in a single colour, Blue. You will also get a laptop bag cover with the product. Do you like multi colour vehicle covers? Then, you are going to love this. In the modern era, you know pollution level has touched the ceiling. Auto Hub’s polyester bag protects even the internal parts of the vehicle from pollution. The manufacturer has concentrated in selecting the fabric so that we buyers can trust on the durability. In case you are too adamant about the colours, you must take extra care in not bringing the cover near any stain. Although the listing says the cover fits only for Activa 3G, you can use it for 4G as well. Have you ever got involved in an awkward situation of seeing bird dings on your seat? When you are about to go out for an urgent purpose, even this feeble and funny situation hinders your way ahead. That’s why you must envelope your vehicle with an all-round body cover. Autofact’s bike cover is water resistant up to a certain degree. Nonetheless, it isn’t water proof. You don’t have to spend years to get it folded up. The lightweight cover isn’t hard to fold and transport. Just like the Fabtec cover you have come across above, this one also has buckle system to keep it intact. You will also get a storage bag inside the package. You knew how I chose the products. And, it is up to you. Which one do you like the most? All the products mentioned here is made of good quality fabric. Though some of them isn’t waterproof, they offers a great degree of water resistance. A few of the covers has buckle system whereas some others use strings to keep them in place. Amazon has now included a feature with some dropdown menus on top of the page to check whether or not the cover fits for your vehicle. You can take the help and boom! There you will have it. 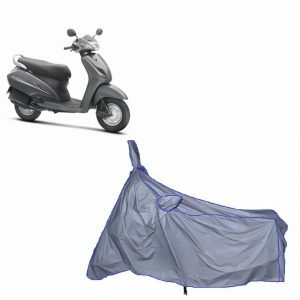 The best cover for your Honda Activa.